M5 Worcestershire southbound severe disruption, from J4A for M42 to J5 for A38 Droitwich. M5 Worcestershire - One lane closed on M5 southbound from J4a M42 to J5, A38 (Droitwich), because of a broken down vehicle. Traffic is coping well. M5 Worcestershire - One lane closed on M5 southbound between J5, A38 (Droitwich) and J6, A4538 (Worcester), because of a broken down vehicle. Traffic is coping well. M5 Worcestershire - One lane closed on M5 southbound from J5, A38 (Droitwich) to J6, A4538 (Worcester), because of a broken down vehicle. Traffic is coping well. England forward Nathan Hughes scores two tries as Wasps beat relegation-threatened Worcester Warriors. M42 Worcestershire southbound severe disruption, at J1 for A38 Birmingham Road. M42 Worcestershire - M42 lane closed on exit slip road southbound at J1, A38 (Bromsgrove), because of a broken down vehicle. Traffic is coping well. M5 Worcestershire northbound severe disruption, from J6 for A4538 Pershore Lane to J5 for A38 Droitwich. M5 Worcestershire - One lane closed on M5 northbound from J6, A4538 (Worcester) in Tibberton to J5, A38 (Droitwich) in Worcestershire, because of a broken down vehicle. Traffic is coping well. M5 Worcestershire northbound severe disruption, from J5 for A38 Droitwich to J4A for M42. M5 Worcestershire - One lane blocked and slow traffic on M5 northbound from J5, A38 (Droitwich) to J4a M42, because of a broken down vehicle. 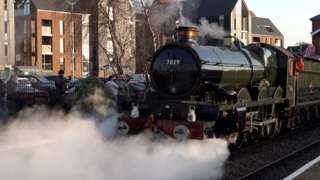 Clun Castle, which hit a record speed of 96mph, took its first mainline public journey in 30 years. M5 Worcestershire southbound severe disruption, from J7 for A44 Worcester to J8 for M50. M5 Worcestershire - One lane blocked on M5 southbound from J7, A44 (Worcester) to J8 M50, because of a vehicle fire. Traffic is coping well. M5 Worcestershire - One lane blocked on M5 northbound from J6, A4538 (Worcester) to J5, A38 (Droitwich), because of a broken down vehicle. Traffic is coping well. M5 Worcestershire - One lane closed on M5 northbound from J5, A38 (Droitwich) to J4a M42, because of a broken down vehicle. Traffic is coping well. M5 Worcestershire - One lane closed on M5 northbound from J6, A4538 (Worcester) to J5, A38 (Droitwich), because of a broken down vehicle. Traffic is coping well. It will be a largely dry night with the chance of some rain and lows of 2C (36F). M5 Worcestershire - One lane closed on M5 northbound between J5, A38 (Droitwich) and J4a M42, because of a broken down vehicle. Traffic is coping well. M5 Worcestershire northbound severe disruption, between J6 for A4538 Pershore Lane and J5 for A38 Droitwich. M5 Worcestershire - One lane closed on M5 northbound between J6, A4538 (Worcester) and J5, A38 (Droitwich), because of a broken down vehicle. Traffic is coping well. M5 Worcestershire southbound severe disruption, at J4 for A38 Halesowen Road Bromsgrove. M5 Worcestershire - M5 lane closed on entry slip road southbound at J4, A38 (Bromsgrove), because of a broken down vehicle. Traffic is coping well. 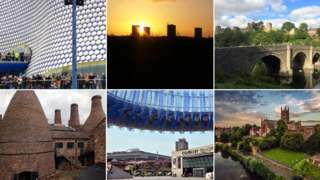 The latest news, sport, travel and weather from across the West Midlands.